Recent release “Life Cycles of an Introvert” from Page Publishing author Timart G. Fischer is a bursting and original compilation of verses that reflect an individual’s yearning for truth and knowledge of the universe and its underlying mysteries. Timart G. Fischer, who has an undergraduate degree in petroleum engineering from the University of Texas in Austin, and a lover of the art of poetry and literature, has completed his new book “Life Cycles of an Introvert”: a teeming library of poems that delves into topics pertaining to religion, spirituality, philosophy, and existence in general. Published by New York City-based Page Publishing, Timart G. Fischer’s copious book suggests a thorough disposition on the thoughts of purpose-seekers and promotes a provoking proposition of self-analysis as well as insights on relatable topics tackled in some poems. 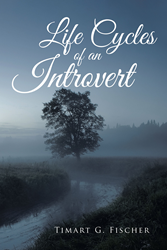 Readers who wish to experience this inspiriting opus can purchase “Life Cycles of an Introvert” at bookstores everywhere, or online at the Apple iTunes store, Amazon, Google Play, or Barnes and Noble.